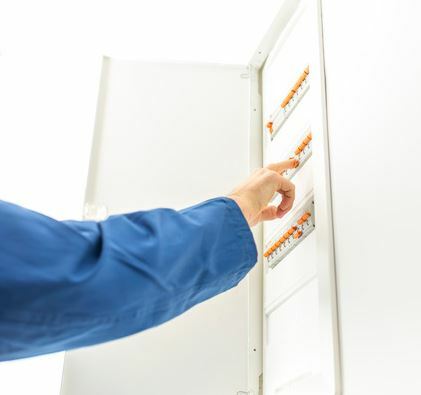 Locate your home’s electrical panel. The first thing you’ll need to do after a circuit breaker trips is locate your home’s electrical panel, if you don’t know where it is. These panels can be located in a variety of places, but more often than not, they’ll be in your garage or basement. Reset the tripped circuit breaker. Resetting a circuit breaker that has tripped is easy to do. All you need to do is open up your electrical panel, find the electrical circuit that is facing a different direction than all the others, and flip it back on. This should restore power to the area of your home where it went out when the circuit breaker tripped. Make sure the power stays on. In some cases, a circuit breaker might trip again after you have flipped a circuit back on. This is the sign of a problem. You may have an overloaded circuit somewhere in your home. You may also have a short circuit. A ground fault could also be to blame. Whatever the case, it’s important to find the cause of the tripped circuit breaker. Contact a residential electrician for help. If you can’t find what’s causing your circuit breaker to trip, you should avoid flipping your electrical circuit back on and contact an electrician for help. Otherwise, you could do some real damage to your electrical circuits and potentially even start a fire in your home. Always on Electric can help you with tripped circuit breakers and any other electrical issues you face in your home. Call us at 970-309-2616 today to schedule an appointment with an electrician. This entry was posted in Electrical Grounding, Miscellaneous. Bookmark the permalink.